There can be hundreds of types of travelers in the world: Leisure, corporate, family, group, backpackers; as we said..hundreds. But when we talk about how to attract business travelers at your hotel, it comes with equally nasty challenges. And now with the global business travel spending forecasted to increase by 7% by 2020, it is the right time to grab this opportunity and find out ways to attract business travelers at your hotel. Today, there is no such thing as traditional business travelers anymore. With the changing dynamics of technology and convenience, even the business travelers are expecting a simple, fast, and incredible service from the hoteliers. Attracting business travelers to your hotel can lead to an increase in occupancy rate, especially in the seasons when there are few room bookings. Besides, the world’s top international hotels like Marriott and Hilton get 80% of their business from such corporate travelers. Most of the business travelers choose need to stay in a hotel for corporate and face-to-face meetings. But business expansions opportunities being constantly available and high, this facet of the industry gives rise to more room bookings, outstanding food menu selection, and amenities that reflect the individual style of these travelers. Not only that, they also help hotels attract new guests and get number of repeat guests from time-to-time. Now, as the need to attract business travelers is established, the question that arises now is – what to do to start welcoming such types of guests at your hotel? Does your hotel suit the requirements of these travelers? Business people travel across the globe for their work. Hence, they want to experience the best during their stay at your hotel. It also happens that entrepreneurs extend their stay because of few unplanned meetings, upcoming events, or due to any personal reasons. In their hectic work schedule, the pressure of work meetings and traveling can build-up a stress in the body and mind causing them to feel overwhelmed. Therefore, they always look for the corporate rates with facilities like de-stress package – that most of the companies organizing business trips demand while booking online. Thus, ultimately you need to turn their business trip into a stress-free one. 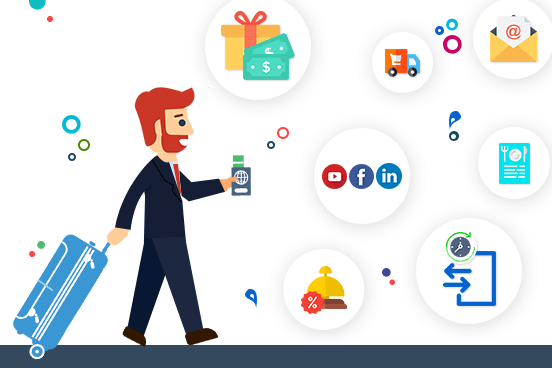 With an excessive use of the internet today, social media channels are in great demand – not only for leisure travelers but among business travelers as well. They use social media to stay in touch with the business experts, to make themselves updated on current business trends, and to check what are their competitors up to. Hence, you can offer them multi-media experiences by advertising through YouTube, Facebook, and other sites too. LinkedIn is also one such famous and apt platform to get in touch with business travelers. While promoting your hotel brand and services, it is necessary to check your targeted guests; keep an eye on their preferences, habits, and all the other factors which may affect their trip and experience with you. Since corporate travelers are most of the times active on their emails, sending them pre-arrival, in-house and post-departure emails on a regular-basis will help you engage with them and make them aware of the services, promotions and extra facilities you might be offering. Let them know about some business trade shows and expos happening in your region. You can even suggest them places to unwind after their hectic day. The entrepreneurs usually come for a professional reason. Hence, your pre-arrival email should offer your business guest the highlighted services that will help make their stay productive and efficient. For instance; would you like to book a meeting room? need restaurant reservations? and more. Whereas, post-stay emails to your corporate clients should target their specific needs like offering them special business packages and discounts. According to a report, more than 45% of business travelers enjoy transportation service from a hotel. The first and the most relevant service that you can ever provide to your business guests is the Airport or Railway Station pickup facility. Waiting for a taxi or taking a public transport can create frustration among your business guests. This is the perfect opportunity for you to impress corporate guests by offering a convenience and hassle-free airport pickup (even add a drop-off later) which is the best way of creating a welcoming environment prior they reach your hotel. For business travelers, time is the most precious thing in their profession (and in our industry as well). Therefore, they always prefer to stay in a hotel where all the processes are quick and easy. So, one most important factor to consider to attract business travelers at your hotel is to speed-up your arrivals and departures process. A paperless check-in/check-out to avoid unfavorable circumstances to save time can work wonders. Today, services like; self-check-in via hotel kiosks or mobile guest self-service portals are also in demand, especially by millennial travelers. Besides, there are several other ways using which you can provide best guest experience during arrivals. Business travelers work more hours when they travel and so, they don’t get time to select from the food options available in the hotels. Instead – they choose to grab and go. This is where you can impress your guests by offering healthy menu items to them. Why so? Because staying healthy and fit while traveling is important to them. Therefore, put up gluten-free and vegan meals for the business guests. Take special care of their food allergies. The guests also appreciate the availability of healthy snacks for example; self-serve toast, cereal, yogurt, and fruits. Hotels run loyalty programs to encourage the guests to return frequently. These programs help you improve your brand value and reputation in the market. With a flexible loyalty program, both the independent properties as well as hotel groups can attract business travelers and retain repeat business by offering what business travelers appreciate; like free nights and discounted stays. The business guests also like the offers that make their trips less tiresome; something like free transportation, complimentary beverages, and discounted spa services. The loyalty programs are not only the best way to attract the corporate guests, but they also provide opportunities to gather guest data that can be utilized further to offer more personalized services to them. The right technology adoption will put you in front of the entrepreneurs in the right way. To cater the business travelers, it is important to focus on the convenience, efficiency, and technology. These types of guests not only bring other such guests at your doorstep through word of mouth recommendations and strong feedbacks, but also help you be open to hoards of new types of guests even in your low-peak seasons. Our cloud-based hotel technology can help you operate your processes efficiently, provide more personalized service without making any mistake, and handle all the corporate rate management, promotions, email marketing and scheduling activities with utmost ease.